Crispy fried discs made with almonds and flour and coated with a sugar glaze – seems to describe this dish well. Taste it and you will agree there is more to this simple sweet. 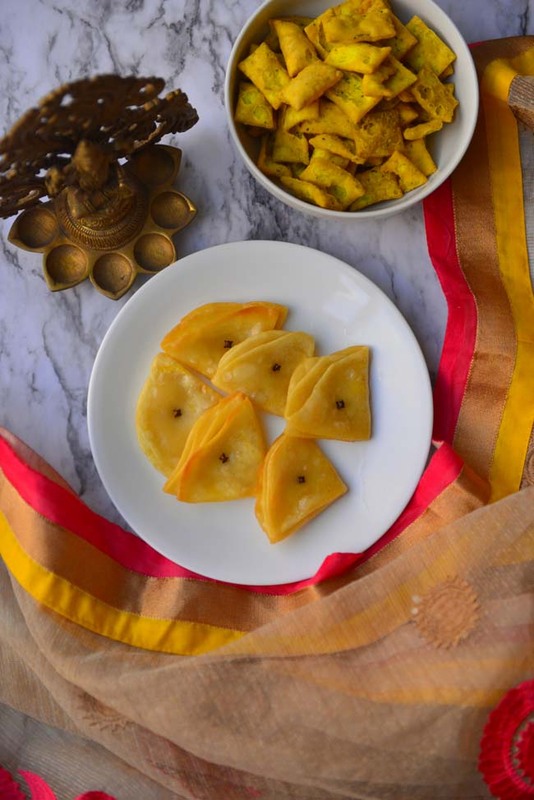 Badam Puri or badami puri is a popular sweet treat made during the festival season. 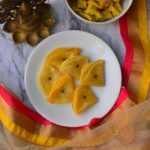 In parts of south India, especially in Karnataka this sweet is made at homes during popular festivals like Diwali and Dussehra. Of course there are regional variations as well. Badam is almonds , and as the name suggests there are almonds in this recipe. In some versions these are made entirely out of flour but still called badam puri. Either way the sweet is made out of a soft dough, fried and soaked in sugar syrup. The version I love is flavored with almonds and saffron. It is fried to a golden brown and soaked in sugar syrup for just a little to acquire a glaze. 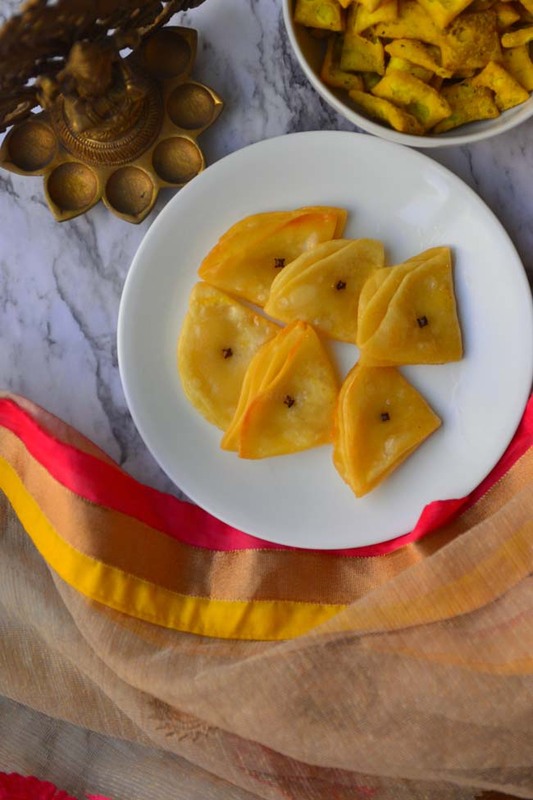 The combination of almonds and saffron is unique and you can taste it in these sweets. All purpose flour or maida as it is called in India is the main ingredient in the dough. To this about ½ measure rice flour is added. Rice flour makes the puris fry crisp and crunchy while the gluten in the all purpose flour keeps it from breaking apart while frying. Raw almonds are used in this recipe. These are soaked in water overnight making it softer and easier to peel off the skin. The skinned almonds are ground to a smooth paste with a little milk. Try to get almonds as finely ground as possible. Don’t worry if the almond paste is not as smooth as a flour paste. You can substitute almond meal/flour as well. I love the combination of almonds and saffron. A little bit of saffron greatly enhances the flavor of the puris. If you are looking to impart color, you will have to add much more, and be very careful in the frying process. If you do not have saffron use cardamom or even vanilla extract. When the dough is made with almond paste it can easily be rolled into a very thin disc. The ground almonds are not as fine as the flour and gives you the friction to prevent the gluten in the flour from springing back as you stretch it out. Roll it as thin as you can, often times I can clearly see the work surface under the rolled out dough. There are many ways to shape this puri. I fold this into quarters giving the pooris a beautiful triangular shape. But you can make a large disc, coat with ghee/oil and roll into a large log – like a cinnamon roll. Slice off pieces from the log and gently press or roll into a thick disc . ..Or you could invent a pattern of your own. Once the puris are fried these are soaked in sugar syrup. Granulated white sugar is used to make the sugar syrup. The sugar syrup is made with 2:1 ratio of sugar to water. The sugar solution is simmered until it becomes viscous. It doesn’t have to reach 1 thread consistency. I look for the same consistency as cooking oil. Poke tiny holes all over the rolled out dough. Soak the puris is sugar syrup 30 seconds to 1 minutes, no longer. These are sweet crisps made with a flour and almond paste dough. The shaped and fried crisps or puris turn glossy after being soaked in sugar syrup. Sweet and crunchy these are the perfect holiday treat. Soak the almonds in plenty of water overnight. Peel off the skin . Measure all the other ingredients and set aside. In a blender bowl add the peeled almonds, and a few strands of saffron. Grind to a smooth paste adding 1 to 2 tablespoons of the milk to help the grinding process. Take the flours and salt in a large bowl. Mix together and add the ground paste. Start to knead while slowly adding the remaining milk. You will use almost all the milk to make a soft dough. Knead until the dough feels very soft and supple to touch. Cover with a damp towel and set aside for 30 minutes. Mix the sugar and water together. Bring it to boil over low heat. Simmer a few minutes until the syrup becomes thick and the consistency begins to resemble that of cooking oil. Set aside and let it cool a little. Keep the syrup warm. Coat the work surface with oil. Divide the dough into small balls about 15 to 20 in number. Roll out each ball into a flat disk about 4 - 6 inches in diameter. It should be thin enough for you to see the rolling surface through, but not so thin that it breaks. Brush the top with melted ghee and fold in half. Repeat it one more time to get a triangular shaped puri. Insert a clove at the center to hold the pieces together. Keep covered if not frying immediately. Repeat the process with all the remaining portions of dough. Heat oil in a thick bottomed pan. The oil depth should be at least ¾ inch for the puris to fry evenly. Keep the oil at medium low heat. 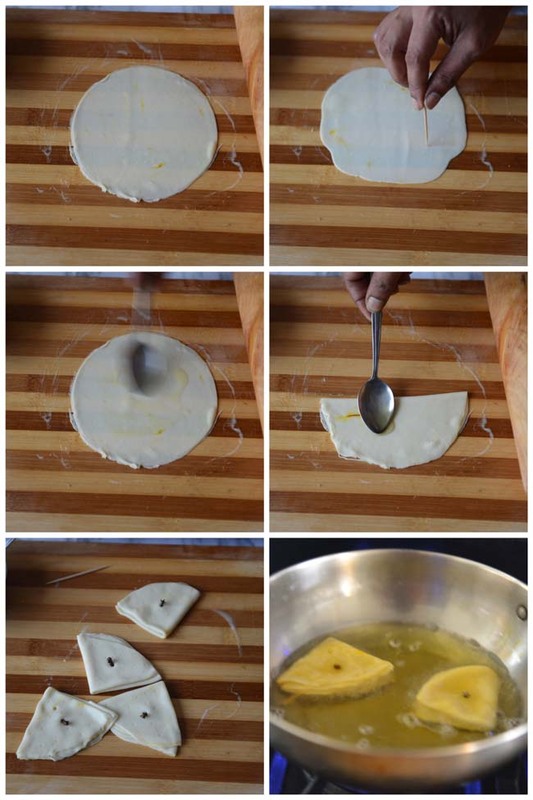 Test the oil by placing a small piece of flattened dough in it. It should sizzle and float up immediately. If it stays soft the oil is not hot enough. It if browns as soon as it floats up the oil is too hot. Turn off the heat and wait for a minutes or so before tying again. Slide in a few of the puris into the hot oil. Let it cook for 30 seconds to 1 minute before flipping it. Flip again if needed and cook until both sides a golden brown. Reserve and drain over paper towels. Repeat the process until the all puri’s are fried. If not using immediately transfer to an airtight container as soon as the soaked puris come t o room temperature. 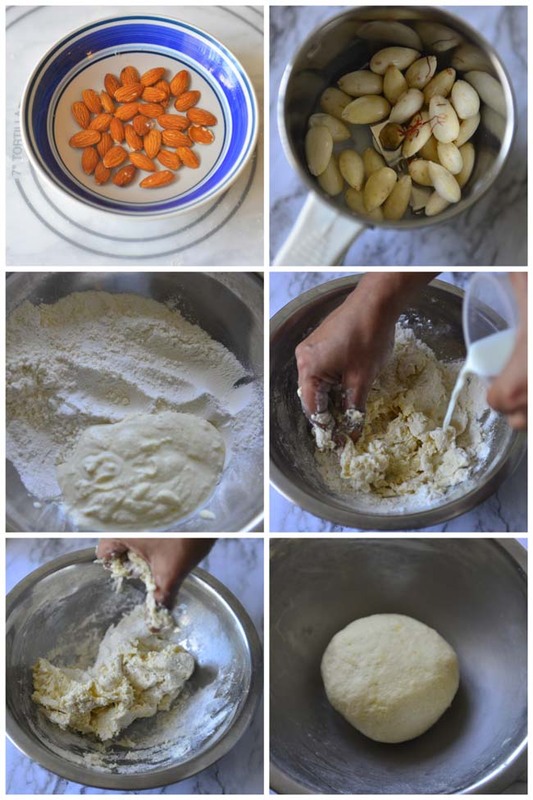 You could use 1/3 C almond flour instead of raw almonds. Flavors around the world ..
Time and a gain I find myself cooking with similar flavors. 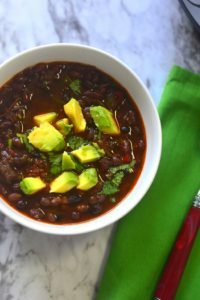 I am glad I found the bloggers at Eat the World Recipe Challenge – just the nudge I need to be more adventurous in the kitchen! If you are a fellow blogger Click here to find out how to join and if you love to cook watch out every month for a new #eattehworld recipe collection. Those looks do delicate and delicious! What a beautiful sweet I had never heard about! Love challenges like this, where we get to know other bloggers and their amazing creations. 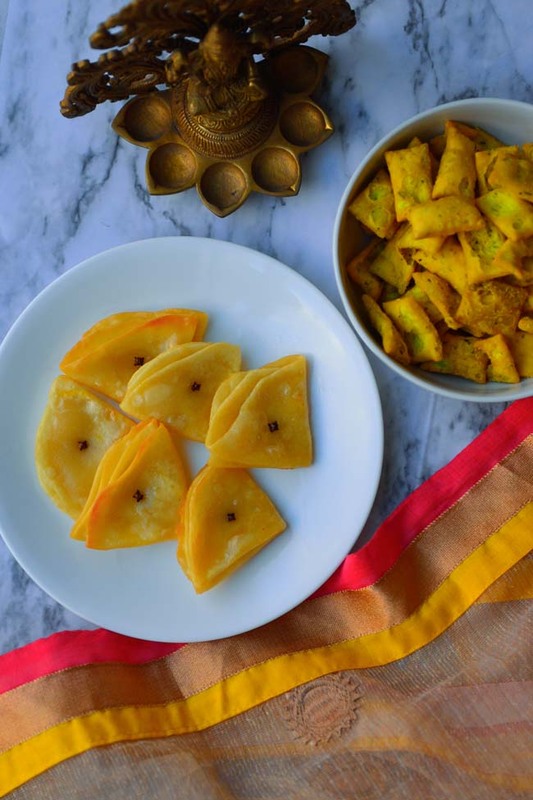 This badam puri would be hard to stop eating once you start 😉 . Thank you for sharing! I have never heard of this recipe and it looks so appetizing, I want to pluck one of the screen. And I love saffron. Great addition to this month. Ha ha , I know what you mean :-). I made just a small batch this time, just enough to make me want to make it again soon ..
Wow, those are a beautiful looking little sweet treat. I loved reading how you make them, and found your photos really excellent and helpful. The colour from the saffron makes them such a lovely golden hue. I’d love to try my hand at these! Thanks for sharing. Thank you ! 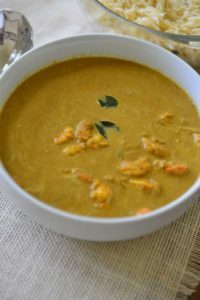 Keep in mind though to get really good color you need a generous pinch of saffron , preferably ground fine and added to the dough. I simply love that mild aroma of saffron with almonds . Almonds and saffron? I’m in love! Thanks for sharing.